What are the most urgent priorities when it comes to workforce development? Miami has historically been a net importer of talent from either the northeastern U.S. or the Southern Hemisphere. While this is a competitive advantage, we also need to establish our own talent base. The Beacon Council’s One Community One Goal Academic Leaders Council, which I chair, is focusing on developing internship programs in conjunction with private sector employers. Because of the velocity of change in the occupational spectrum, universities are limited in their ability to train graduates into the specific niches this global economy is creating; the applied dimension can come only through the internship modality. Improving the level of talent in the workforce is a shared responsibility between the universities and the private sector. How would you comment on the university’s ability to attract talent – faculty, fellows, researchers, etc.? We have hired 500 new faculty in the last five years, across all departments, but the issue is not talent acquisition; it is talent retention. Maintaining laboratories and infrastructural support to retain the best talent is a costly enterprise and we are becoming more competitive in those areas. This is why we have been building so much – we’ve either finished or started roughly $349 million worth of construction projects in the past five years. Can you speak to the funding landscape for public universities in Florida? We created a forefront funding offensive that maximizes the state support we receive, while more aggressively fundraising through philanthropy, establishing private sector partnerships and competing for federal research dollars. Our budget has grown by about 25 percent in the last five years. We supported that through tuition increases in recent years, but that era is largely over. Additionally, we have benefitted from the enrollment of 14,000 new students and the savings from efficiencies we have been able to drive, particularly in the area of energy. In which programmatic areas does FIU excel? Academically, we have identified four strategic thematic areas to focus on: international/global studies, environment, health and the arts. In those areas, we are strong, as well as in hospitality, accounting, management, and liberal arts. Moreover, our geography and our demography are our destiny. As such, we have a strong international element. 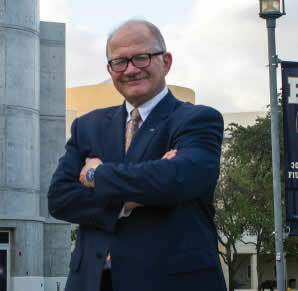 FIU has the second-largest number of foreign students in Florida. We have worked in Latin America for over 40 years, and have a strong name in the region for our administration of justice and democracy initiatives. We also have a campus in Tianjin, China, which awards FIU degrees to 1,100 Chinese students and focuses largely on hospitality and tourism management.